Easy to use alarm clock and reminder application. Is there a better alternative to NeoAlarm? Is NeoAlarm really the best app in Desktop category? Will NeoAlarm work good on macOS 10.13.4? 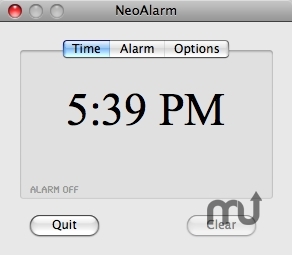 NeoAlarm is an easy to use alarm clock and reminder application. There are several preset alarm sounds and the ability to choose any mp3 or play a random iTunes track. It also features a persistent alarm feature, optional 24 hour format setting, speech, a reminder message and more all wrapped up into an easy to use interface. NeoAlarm needs a review. Be the first to review this app and get the discussion started! NeoAlarm needs a rating. Be the first to rate this app and get the discussion started!